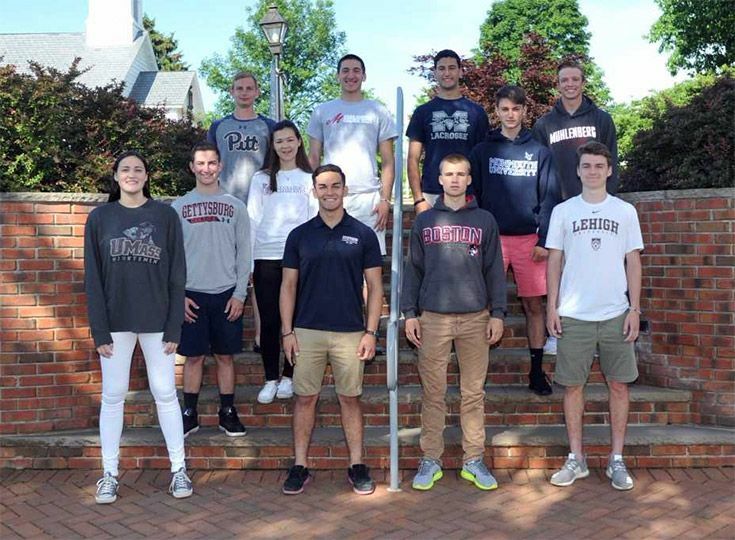 Among this year's 85 graduates, 11 will continue their athletic careers in college next year. Congratulations and best of luck to our college-bound athletes. At Gill, Allesch was a four-year varsity starter for girls' basketball, helping the team to Somerset County Championships and Skyland Conference Division Championships. She finished her career with the Knights more than 800 points and over 600 rebounds. A three-year varsity starter for boys' soccer, Aunger opted to spend his senior season training with Red Bulls Academy. He finished out 2015 with four goals and 12 assists. Bednarsky was a four-year varsity starter for boys' soccer, helping the team to two state championships. The midfielder ended his senior season as Courier News Player of the Year, Skyland Conference Player of the year and the designation of first team All-State, All-Conference, Somerset County and All-Prep. A four-year starter with the Knights, Brito led the team in scoring during his senior season, collecting 25 goals and 12 assists. His post-season honors from his senior year include first team All-Prep-B and All-Conference. Scoring powerhouse Nick Cooper posted 94 goals in his junior year—the first year that Gill fielded a varsity squad. He was also the number-one goal scorer in New Jersey, ranked second in assists and achieved the highest point total (166) in New Jersey and the third highest in the nation. Cooper's senior season was on track to be another banner year, but the team cut the season short, due to injuries. In four of the six games he played, Cooper notched eight or more goals and he led the team by a wide margin in both goals and assists. As a junior, goalie Will Dadouris collected 197 saves, won ten games and conceded only four during the team's inaugural varsity season. In his senior year, he was on track for another banner year, winning five out of six contests and recording 89 saves when the team curtailed the remainder of the season due to injuries. Dadouris also contributes to the game off the field, distributing lacrosse equipment to underserved programs through his not-for-profit Relax Collections. Left-handed pitcher Cam Miller has been a staple of the Knights baseball program throughout his Upper-School career, both on the mound and at the plate. A should injury kept him pitching a full complement of games his senior season, but in his junior year, he recorded 51 innings with 18 earned runs and maintained a .360 batting average. Post-season honors from 2016 include first team All-Prep B and All-Conference. A four-year starter on varsity boys' soccer, the midfielder ended his senior season with first-team designations for All-Somerset County, All-Area All-Prep-B and All-Conference. A solid defender, Miller could also be relied on to make big offensive plays, especially in tournament competition. A four-year contributor to the varsity program at Gill, Michael Morreale has been a stellar defender and a significant contributor to the offensive picture. In his senior season, the 6'5" player amassed 318 points, 99 rebounds and 30 assists. He came through with the big plays, including posting 21 (a season high for Morreale) in the state semifinals against Roselle Catholic and could be counted on for more than his share of three-pointers. A major offensive contributor, Mrkulic posted 23 goals and 12 assists in his senior season—one goal shy of his 2015 season, when he managed a double hat trick in a 7-4 win over Immaculata. Post-season honors for the Monmouth-bound player included designations of All-State, and first team all Prep-B and All-Conference. Matt Petit has been a contributor to cross country and track and field throughout his Upper School career at Gill. The runner finished his senior season winning the 1600m at the Prep B championship and qualifying for the Meet of Champions. He also earned post-season designations of first team all-conference and all Prep-B. During cross country in the fall, he won the Newark Academy Invitational in September. He ended the season with a trip to the Meet of Champions and post-seasons designations of all-conference and all prep. Maggie Munz has been riding her entire life, receiving her first pony (a gift from her grandfather) when she was less than a year old! Since that time, she has competed in New Jersey, New York Pennsylvania and Florida. She was the circuit champion in Ocala, Florida, in 2010, reserve champion at the Marshall and Sterling finals in 2013 and Zone II Children's hunter champion in 2013. More recently, she was the New Jersey Professional Horseman's Association (NJPHA) junior hunter high-score award winner in 2105. In 1991, the College of Charleston women's equestrian team became the first NCAA Division I program. They have competed, and continue to compete, in the intercollegiate Horse Show Association. The program is run out of Storybrook Farm in Charleston South Carolina.